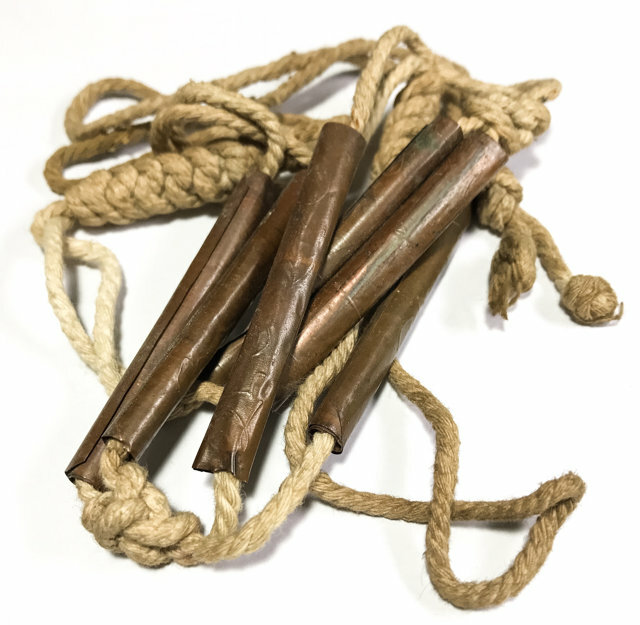 An Extremely Rare, highly Preferred Takrut Sariga Hok Dork - Sacred set of 3 pairs of Takrut Sariga Copper Yantra Foil Spells (Tong Daeng) on the original old cord belt, as bound together by the Great Luang Por Jong Puttassaro of Wat Na Tang Nork. This powerful sixt-fold Wicha Takrut Compendium is an incredibly rare exhibit with hand inscribed and empowered spell inscriptions, made in the days of old by the Great Master Luang Por Jong. The Takrut Kart Aew provides 6 different Magical Wicha, covering an immense range of protective and Karma Improving Powers, for Metta Maha Niyom, Kong Grapan Chadtri, Klaew Klaad, Serm Yos, Serm Duang, Maha Sanaeh, and all other imaginable Magical Blessings for a complete compendium of Auspicious Lucky Fortunes and Safety. The Takrut are made from Nuea Tong Daeng (Sacred Copper Yantra Foils), and are bound together into three pairs composing a total of 6 Scroll Spells.